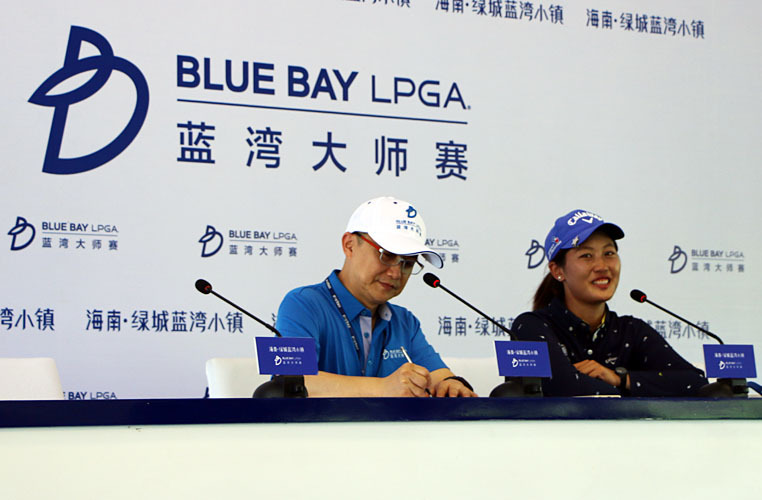 Xiyu Lin of China is warming up for her Sanya Ladies Open title defence at Yalong Bay next week with a strong performance at the Blue Bay LPGA, which is approximately one hour’s drive away. Lin, who will be targeting her third straight Sanya Ladies Open victory next week, opened with rounds of 72 and 68 at Jian Lake Blue Bay Golf Club for a four-under-par total, to sit eight strokes behind the halfway leader Minjee Lee of Australia in a share of fifth place. Hainan is a special place for Lin, as she has had a string of strong results on the tropical island, beginning at the 2010 Sanya Ladies Open, when she finished in ninth place as a 14-year-old amateur. She finished fifth at the 2011 tournament on her professional debut aged 15 and tied for fourth in 2012, before joining the LET. The success story continued in her rookie year in 2013 with two top-10 finishes at the Sanya Ladies Open and World Ladies Championship in Haikou, Hainan. In 2014, she earned her first LET win at the Sanya Ladies Open before going on to win the title for a second time in 2015, a week after recording a career-best tie for fifth at Blue Bay on the LPGA. Last year, Lin finished tied for fifth at plus three at Blue Bay, but she is already four-under-par for the tournament. She continued: “As far as this year, maybe because at the very beginning, the green conditions were actually softer, so it was easier for us to hold the ball there. And also, it’s not that windy every day. The seventh edition of the Sanya Ladies Open takes place at Yalong Bay Golf Club in Sanya from Thursday 27 to Saturday 29 October. The field of 126 players will be cut to the top 60 and ties after Friday’s second round.